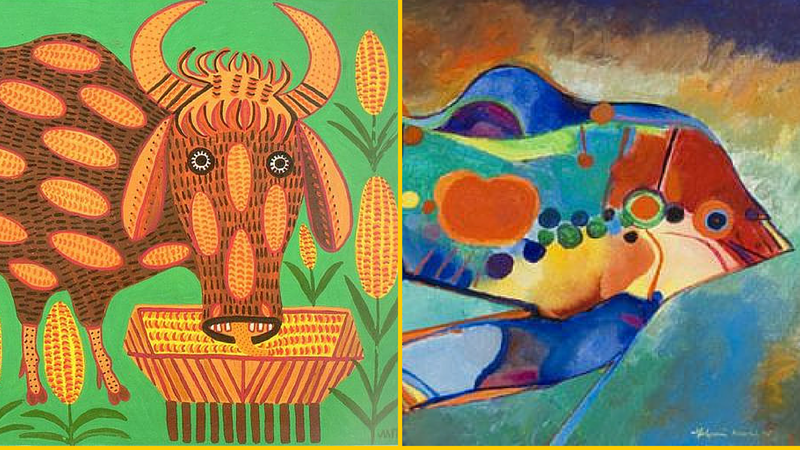 Composite of parts of two paintings: A Cow Like That Gives 5,000 Liters a Day, by Maria Primachenko, and Fish, by Aldemir Martins (both via WikiArt). In late-March, the Livestock and Fish Research Program held a virtual review and planning meeting to take stock of progress since 2012, examine the wider science and development environment and devise plans and deliverables for the coming years. The discussions were organized around each of the five research and technology ‘flagships’ of the program, examining strengths, weaknesses and desired results. The Animal Genetics Flagship works to ensure that by 2023 choices of improved and appropriate livestock and fish breeds and strains are widely available, used sustainably and are equitably providing nutritious, affordable food and income for the poor. Demand for healthier, higher performing and higher yielding animals through genetic improvement and the dissemination of those genetic gains to animal producers is increasing in the developing world, where rising populations and incomes are raising the need as well as demand for nutrient-dense milk, meat, fish and eggs. In response, many small-scale livestock and fish producers, processors and service providers are working to become more commercially oriented. At the same time, global warming is causing many of them to have to cope with more variable and extreme climates and most face on-going reductions in their access to fresh water, productive lands, healthy agro-ecosystems and other natural resources. What’s needed are animal stocks better tailored to their (changing, resource-scarce) environments and more profitable, efficient and sustainable smallholder animal production systems. Animal genetics, along with animal health and feeds, is one of three traditional pillars supporting such transformation. Recent advances in molecular genetics and genomics enable scientists not only to characterize the genetic diversity and compositions of breeds and to develop higher yielding stock, but also, increasingly, to identify the genes controlling other important and complex animal traits such as resistance to disease and drought and resilience in the face of fodder scarcity and harsh environments. These scientific advances are particularly critical for programs aiming to improve developing-country livestock and fish, which as yet still greatly underperform compared to the improved breeds and strains of livestock and fish that are the mainstay of industrialized countries. The Animal Genetics flagship is identifying and promoting improved breeds and strains as well as developing new ones. It is developing robust delivery systems that ensure that poor livestock and fish producers can access these genetic resources. The flagship employs both traditional and novel animal breeding approaches adapted to the low-input systems used by smallholder food producers. It makes use of the latest technologies in phenomics (measurements of the changing physical and biochemical traits of organisms in response to genetic mutation and environmental influences), genomics (molecular investigations of the structure, function, evolution and mapping of genomes) and reproductive biology (studies of the mechanisms regulating reproductive processes in livestock and fish). In both its development and delivery work, this flagship also makes use of advanced information and communications technologies, tools and methodologies promoting gender equity, and programs strengthening capacities for livestock and fish research and development work. 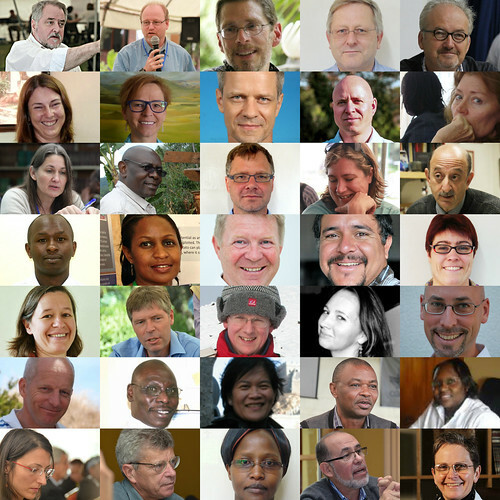 John Benzie, a fish geneticist at WorldFish and leader of the flagship, started the virtual discussion with a short overview of the work of his flagship. Click on the presentation below to listen to his audio-enhanced slide presentation. Decision-making: Much discussion centred on the importance of developing clear breeding goals and who should determine these or be involved so as to ensure an appropriate fit to a given farming system and its environment. Opinions varied as to the extent to which a variety of value chain actors (e.g. processors, marketers, consumers), in addition to farmers, should have a say or be consulted as well as the proper extent to which women’s choices should be solicited and adhered to. Examples of farmer involvement in determining breeding goals, and of gender-responsive approaches, in the program’s present work were given. Some argued the need for integrating approaches to improved feed, health and breeds. The discussants agreed to summarize breeding goals for particular value chains for the second phase of the program. Time scales: The long time needed to develop genetically improved breeds, and the need for unbroken investment over that time to achieve production goals, was highlighted. It was agreed that it is in the nature of animal breeding research that significant development impacts in this area are achieved only over the longer term. Indeed, it was emphasized that much of the current Livestock and Fish work involves improved strains developed with considerable investment by CGIAR starting long before the start of this program. However, the scientists agreed it will be important also to initiate new breeding activities for the various value chains Livestock and Fish works in, even though these will take a long time to bear fruit. Capacity building: Participants discussed wide variations in the levels of capacity within Livestock and Fish’s targeted value chains to maintain the genetic improvement of their animal and fish stocks. Without such capacity, it was agreed, as well as the ability to disseminate genetic gains widely, farm communities would not be able to sustain the gains achieved, however sophisticated the genomic and ICT tools used to rapidly identify appropriate breeding traits. This challenge raised a related problem, that of uncontrolled, indiscriminate animal breeding, which is still common in smallholder farming communities and which can reduce, and eventually wipe out, any genetic gains made. Farmers and farm communities must therefore be encouraged to maintain good breeding practices through appropriate incentives. Impact assessment: The discussants noted a dearth of information on the impacts of genetic improvements of animals and fish in developing countries and the importance of obtaining this information for Livestock and Fish. Such information is also needed, they said, to build an evidence base for continued investment in genetic improvement programs. Future impact surveys should be designed to elicit gender disaggregated information. And the ICT systems now being used to collect genetics data and farmer feedback should be modified to include gendered information. Benzie also noted that in recent years researchers had produced a locally suitable GIFT strain of tilapia (O. niloticus) in Asia, an Abbassa strain in Egypt, an Akosombo strain in Ghana and a strain of indigenous fish (O. shiranus) in Malawi; they had assessed the genetic resources of the small mola fish in Bangladesh due to its importance for women and young children; and they had new work on carp in Bangladesh that should produce an improved fish by 2030 (‘a fairly quick turnaround’!). 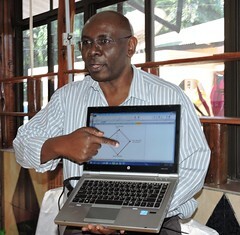 Okeyo Mwai, a livestock geneticist at ILRI, added that scientists had genetically improved indigenous disease-resistant red Maasai rams and flocks in collaboration with local Maasai pastoral communities, and were combining genomic and ICT technologies, which is speeding development of more precise breeding objectives and delivering desired genetic gains faster. In Ethiopia, said Aynalem Haile of ICARDA, the emphasis has been more on expanding the use of community-based breeding programs. 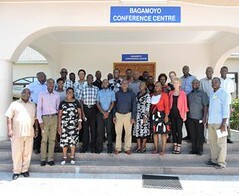 ‘I’m looking forward to seeing the extent to which the proposed breeding and delivery programs embrace various production systems along the gradient of intensification,’ said Amos Omore, a veterinary epidemiologist at ILRI and leader of the program’s value development team in Tanzania. There has never been a better time for the science of animal genetics, with very recent (and very big) breakthroughs in the fields of genetics and genomics promising unprecedented refinements in breeding work. This group of CGIAR Livestock and Fish scientists is working to ensure that those breakthroughs benefit small-scale livestock producers and consumers throughout the developing world. Tags: arpm. Bookmark the permalink.